I like pumpkin’s sweet flavor, similar to a couple of my other favorite autumn squashes: butternut and acorn. Their sweetness is brought out by roasting, and the butter and brown sugar I put in the hollow of an acorn squash. This recipe is ideal for a party, which is where I first had it. Four ingredients make it easy, and it can be made ahead or at the last minute. Combine all ingredients in a large bowl and mix with a wooden spoon. If the Cool Whip has frozen lumps, work them with the spoon against the side of the bowl. Cover and chill. 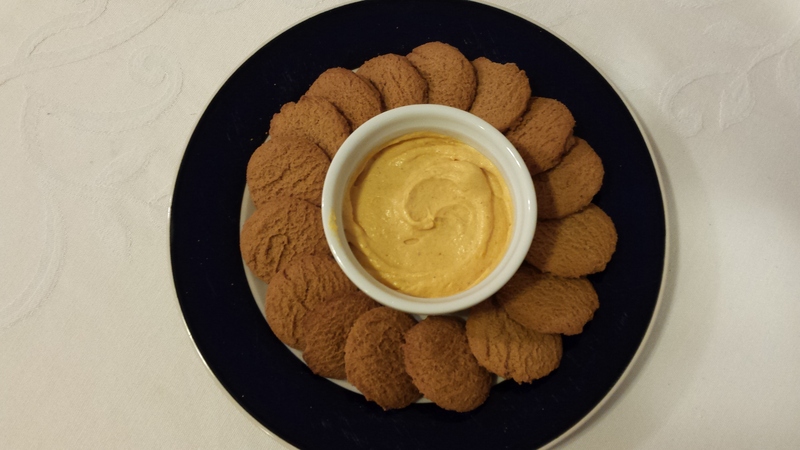 Serve with gingersnaps (as shown below) or chocolate wafer cookies. This would also make delicious individual parfaits, layering crushed gingersnaps with the pumpkin whip. What is your favorite pumpkin food or beverage?